The history of Kobe beef goes back through American and Japanese history. Kobe beef is originally from the Wagyu cattle raised in a region surrounding Kobe, Japan. 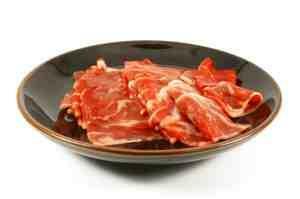 The beef is also known as "white beef" because it appears "white" due to its extensive marbling of fat. This marbling leads to superior flavor and tenderness. Kobe beef is extremely expensive. Pricing for an 8 oz rib-eye, for example, runs in the neighborhood of $100. While Kobe beef comes from Japan, Wagyu cattle are raised in other places, as well, including the United States and Australia. Typically this type of beef bears the designation "American Kobe beef" or "Australian Kobe beef". It is important to note that while all Kobe beef comes from Wagyu cattle, not all Wagyu beef is Kobe beef. If it is indeed Kobe beef, it will be labeled as such. If it is labeled Wagyu beef, it most likely is not Kobe beef. Because of Buddhist traditions and cultural factors in Japan, eating beef (and meat from all four-legged animals) was prohibited in Japan for nearly 1000 years, until 1868. In 1868 following the Meiji Restoration, the new leaders of Japan lifted the ban on eating meat in order to encourage Western habits and weaken the power of the Buddhist influences in the country. It took another 100 years before meat eating became widespread in Japan after the lifting of the ban. In spite of the thousand year ban on eating four-legged animals, some say that the history of Kobe beef spans back to feudal times, when the shogun ate beef from Waygu cattle (the cattle cultivated for Kobe beef), although most Japanese believe that this is not true. Wagyu cattle were actually introduced to Japan in the second century BC as working stock for the cultivation of rice. Because of the isolation of the landscape, the cattle remained genetically pure. In about 1955, rice cultivation was mechanized. This led to an increase in the availability of cattle as a source of beef. At the same time, the Japanese people in general began to experience a rise in income, making the purchase of beef for dietary purposes more within their budget. Beef consumption in Japan began to rise. When considering the history of Kobe beef, one must also consider the origin of the Waygu cattle. While Waygu cattle are now considered indigenous to Japan, they are not native to the country. It is a widely held belief that the cattle were brought to Japan by Japanese ancestors over 2000 years ago. They are most closely related to the cattle of northern Europe and Scandanavia. After World War I, the government formally recognized the three breeds of Wagyu cattle, Japanese Black, Japanese Brown and Japanese Poll. Fifty years of careful selection and breeding followed, and the result is today's Kobe beef. Different breeding and feeding techniques were developed, such as massaging the cattle with sake and feeding them beer. Many in Japan believe that this is the reason for the superior flavor, fat and tenderness of Japanese Kobe beef. The Japanese government, in order to protect its domestic beef industry, prohibited the export of living Wagyu cattle for decades. The first Wagyu cattle were imported to the United States in 1976 - four bulls in all. Then, in 1993, two males and three females were imported, followed by 35 cattle in 1994. As the cattle herd grew in the US, the Wagyu cattle were cross-bred with Angus cattle, because many Americans found pure Waygu beef too "white". It is this cross-breed that is known as American-style Kobe beef. American Kobe beef are fed corn, barley, wheat straw and alfalfa. Kobe beef is a gourmet delicacy that many consider well worth the price. Both Japanese and American styles of Kobe beef are available in the United States, primarily in steak houses and through online ordering.